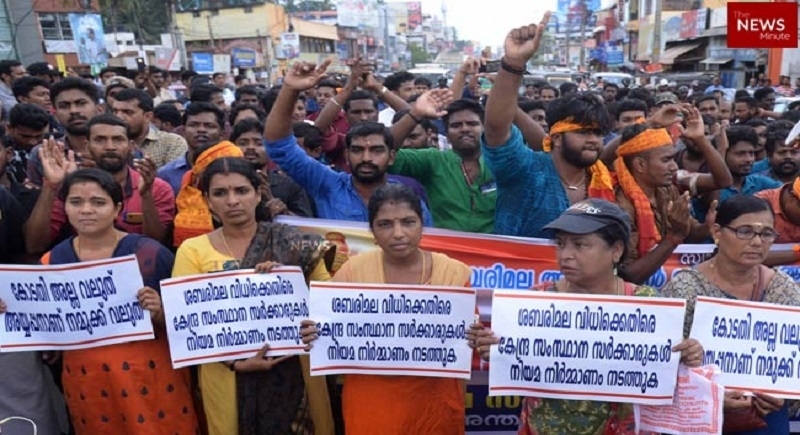 Thiruvananthapuram, Oct 3: Ironically though, thousands of women and men on Tuesday marched in protest of the Supreme Court verdict removing the age restrictions and allowing entry to all the female devotees at the Sabarimala Temple in the state. They took to the street in Pandalam chanting the ‘Ayyappa Keertanam’ or ‘Nama Japa Yatra’ as it was described, as mark of their protest. Needless to say, the Hindu organisations have taken the lead in organizing these protests held statewide. Responding to the call given by the erstwhile Roya;l Family of Pandalam, who had great stakes at the tradition and rituals at the temple and the newly floated Ayaappa Dharma Protection Samithi the protesters blocked traffic at Kochi, Palakkad, Pandalam, Kollam and Thiruvananthapuram. The Antharrashtra Hindu Parisahd (AHP) also organiased the protests in other places. Pandalam witnesses a biggest turnout of protesters including large number of women participating in the ‘Nama Japa Yatra’. The protest march started from the NSS Medical Mission junction and culminated on the Valiyakoickal Sastha temple premises around 5.45 pm. Addressing the protesters P G Sasikumara Varma, president of the Pandalam Palace Managing Committee said that the protest was for protecting the ‘Ayyappa Dharma’ and the rituals and traditions at Sabarimala. He appealed to the devotees across the country to stage a unified protest from a common apolitical platform to thwart any move to destroy the age-old customs and traditions at Sabarimala. It was not that women were barred from entering Sabarimala temple and have ‘darshan’. The bar was only for the women between ages 10 to 50 years. Women below the age of 10 and above 50 years are permitted to visit the temple. There is logic behind this. The Sabarimala Ayyappa is a ‘Naishthik Brahmachari’ practising the severest form of celibacy. This particular state of celibacy forbids the Lord Ayyappa to be in presence of women and this restriction is self-imposed lest his penance is disturbed. There are other Ayyappa temples where he is not in a Brahmachari state and women are permitted to enter the temples and worship the Lord. Women below ten years are children and above 50 are motherly. So they can enter the temple. The apex court verdict is pronounced without taking into consideration of this self-imposed restriction was specific to Sabarimala temple only and that too by the deity himself. The court seems to have failed to recognise that the ban was not general but specific to Sabarimala temple and not related to period. The political parties, however, have not yet made their views clear on the issue. The Congress as expected supported the verdict but allowed freedom to its Kerala unit to express its opinion depending upon the sensitivities of the state. The BJP wanted the government to be cautious while implementing the court order.